Do you ever feel lost or drowning in your own uncertainties? That you have so much to overcome? That you are too ordinary? Not enough? At times, I am swallowed up by those all-too-familiar feelings of doubt and inadequacy until I feel as if I am suffocating. Unable to serve like I want to, unable to encourage others and lift them up, unable to give of myself unselfishly, and unable to have a heart of true gratitude, praise, and thanksgiving. And in moments such as those, I try to remind myself of the story of Gideon. Someone who truly in every single sense of the word felt truly inadequate. Not enough. Ordinary. Unable to be used mightily of God. I love those moments in Scripture that remind us that this person was this, or that, and common, BUT God… for He turns ordinary in extraordinary and elevates common circumstances to moments that are completely uncommon and awe-inspiring. 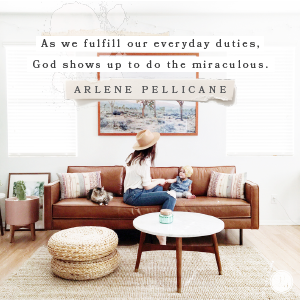 I was having one of those days recently that I was feeling swallowed up and smothered over, and I read the below devotion from Proverbs 31, and although I am not a mother and my days share very little in common with the author of this post, truth is truth and I gleaned inspiration and encouragement from her sharing her heart’s cry. It’s the calling of the mighty warrior in all of us. For, I definitely believe it is in there. “I remember being a new mom and finding great solace in the bathroom. Some days I wanted to hide in there for long stretches of time from my energetic toddler. My son Ethan loved to turn off the light in the bathroom and shut the door. He would giggle from the other side. I didn’t care about being in the dark. I was just happy to be left alone for a moment. I didn’t feel at all like a mighty warrior. I felt more like a nobody hiding out. This is how I imagine Gideon’s disposition was in Judges 6. During this time, the Midianites had overpowered and dominated Israel for seven years. The Israelites hid out in mountains, caves and forts. Like an invasion of locusts, the enemy came in and took over. They destroyed Israel’s crops and devastated the country. In desperation, the people of Israel cried out to God for help. The crying children overpowered the mothers. Because of their whiny, unhappy little ones, the mothers made hideouts wherever they could find them — the bathroom, local coffee shop or hidden in the laundry room. The children wreaked havoc in the kitchen and family room. Their toys were like an invasion of locusts. The mothers, reduced to wearing sweats and cutting up food all day, cried out to God for help. “The LORD is with you, mighty warrior” (Judges 6:12b). Gideon may have looked behind him to see if the angel of the Lord was addressing someone else. After all, he was hardly qualified to save Israel, coming from the weakest clan in Manasseh and being the least in his family (verse 15). Yet apparently to God, Gideon was a mighty warrior. I believe God sees mighty warriors in each of us too. Imagine going about your daily work, making dinner, paying bills or sorting laundry and God appears to you saying, “The LORD is with you, mighty warrior.” This would undoubtedly change your life. It doesn’t matter how you were raised as a child, whether you’re rich or poor, God makes victors out of the ordinary and overlooked. God seems to delight in working powerfully through unexpected “warriors” such as Gideon, Rahab and Ruth. Don’t let your past determine your present or your circumstances dictate your worth. God is the giver of new life. Notice God appeared to Gideon in private. Wheat was normally threshed in open spaces, typically on a hilltop so the breeze could blow away the chaff. But fearful of the Midianites, Gideon worked hidden away in a sunken winepress. God can meet you in the privacy of your home when you’re tending to your family members, thinking no one notices your efforts. You might be caring for a toddler, teenager or aging parent. Or you may be at your job, doing your daily work when God shows up to speak to you. Gideon was a simple man living a normal life, but as he fulfilled his everyday duties, God showed up to do the miraculous. Gideon was teachable because he listened to what the angel of the Lord said. He rose to the daunting occasion of delivering the Israelites. He didn’t do it perfectly, but God’s strength is perfected in weakness, isn’t it? Barely inching into April and the Atlanta area has already seen its big Spring bloom with Cherry trees, the Dogwoods, and even the azaleas we are so known for during Master’s season in Augusta. Our temperatures are looming well into the 70s and 80s most days with a light breeze in the afternoons. Summertime is just about upon us, and I for one, enjoy the longer days, the sunny afternoons, and the days spent sitting on a beach somewhere with a good book. What I am not looking forward to so much is the humidity, but you know, you have to take the bad with the good sometimes, and we Southerners certainly know that to be true. So, I wanted to share with you some of my favorite Summertime trends, accessories, and fashion statements that transfer from the runways to the stores and boutiques right to your very own closet. How to wear them. Where to find them. Statement Sleeves, or kimono-blouses, are all the rage this season, and I was a quick and easy convert and I jumped on that bandwagon early, and often. So light, airy, and ultra-sophisticated. Even for the office! The Matea Off-the-Shoulder Pull over is just the right amount of statement sleeves, for those just wanting to dip their toe in the deep end. It’s a trend worth trying! Stunning with jeans, chinos, shorts, or tucked into a skirt all summer long! There is something ultra chic and edgy about a bomber jacket. Plus, they are typically lightweight and many are weather resistant perfect for a throw-on-and-go look all summer and fall long. And they range from sporty to feminine and everything in between. Very versatile! There is something about that crisp and clean white, but it also comes in Mint, Yellow, and Navy. I have to say, I am sort of partial to the embroidered versions. Don’t know what it is exactly, but they speak to me! I know what you must be thinking… Tropical florals for summertime and vacation season? Not exactly a revelation, and in truth it is not, but I am not a huge wearer for floral patterns, but these ruffled, dainty slip dresses and maxi skirts and sweaters have me all like… whoa! I need to give bright florals another try! Crushing on that rich combination of pink & tangerine! And, this dress features another very “hot right now” trend of one-shoulder detailing. So, it’s two for one! And who could resist a good, classic Palms print? A delicious skirt for summertime, and can easily be dressed up or dressed down depending on the occasion. The “Jackie” Cotton Cardigan is a classic cardigan that I have in a variety of colors and they are perfect to throw on over a tank, a dress, or paired with a skirt or pants. And this Cotton Jackie Cardigan in Florida print is a fun, quirky update to a classic perfect for this summer season. And it’s currently up to 30% off online!!! Don’t you just love that dusty blue suede? Yum!! And I love the platform for a little extra lift as well. Doris Kork Sandals by Raphaella Booz are gorgeous and certainly make a statement! And, again at $78, an affordable fashion sandal. Plus, kork is so versatile and can be worn with anything and any color! Trenches. They’re not just for coats anymore. Trench dresses and Trench vests are making a splash this spring & summer. And JCrew’s Garment-Dyed Trench dress is simple and ultra-sophisticated. It is shown above in classic khaki, or Golden Tea shade, but also comes in a blush pink and a true navy. Or maybe an Embroidered Floral Trench? Always an incredibly investment into your personal closet. A trench is timeliness in every way. Just a touch of laces and grommets on this swing tank. It’s a familiar trend, and a comfortable one for most, but is just a small update classic to your staple tees and tanks that punches up the style a bit. Perfect paired with jeans and sandals for a casual Saturday or Sunday afternoon, or even with ankle pants, wedges or pumps, and a blazer or sweater for a more professional, polished look. Or a lace-up shirt dress? Love the simple styling of this pull-on-and-go easy chic dress for summertime. All you need is a hat, sunglasses, and sandals and you are off! Comes in black (as pictured above) along with navy and ivory as well. Everything old is new again. Isn’t that so just the case with some of the styles we have seen return to fashion? And wide leg pants, culottes, and flare jeans from my most favorite fashion decade, the 70s, have made their return in 2017! And I am seriously crushing on these bright, cherry red linen crop flares from Cartonnier at Anthropologie for $98. Comes in Orange and Royal Blue as well. And a more understated flare? These are just perfect! I love their Script denim jeans, most any style. I have a few pairs hanging in my closet right now, in fact! These are a nice, dark wash with a nice, slightly-wide, cropped leg, undone frayed edges, 5-pocket styling, and made with cotton & spandex for easy wear. The Script is one of my go-to’s! Athletic leisure is a big fashion trend for this year, and I am not a huge fan of jumpsuits or matching sweat outfits, but I love the idea of these updated, ultra-feminine and funky sneakers that can be paired with your favorite jeans and T shirt or even with a maxi skirt and tank for a stroll through the farmer’s market or brunch out with girlfriends! I’m sorry. I have a thing for these. The suede, the platform, the ruffles, the simple styling. So perfect! Superga Sneaker Mules are the perfect athletic slide perfect for lazy Saturdays. And they are just $68! So, those are just a few of my current crushes for this summer season, but that’s certainly not the extensive list! Have fun exploring these and so many other Summer 2017 fashion trends!